The equipment displayed on their stands included a selection of Magnetic Separators. Both exhibitions proved to be successful, with leads for both magnetic separation and metal detection equipment. 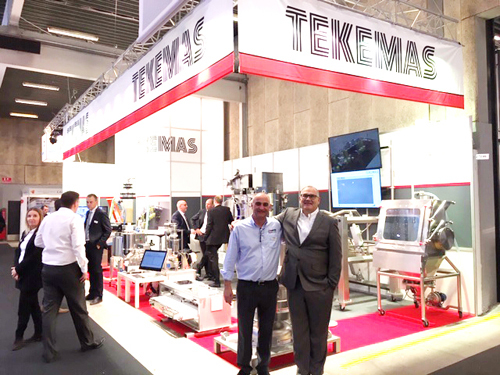 Tekemas is based in Rodovre, Denmark and specialises in providing solutions in the handling and processing of powders and granules. They represent a number of international equipment and technology suppliers including Wysetech Materials Handling and Matcon. Scanpack is an international event for the packaging industry. Exhibitors showcase solutions for the entire packaging process. Visitors included managers, marketers, brand managers and others involved in packaging, from conception and design, through to production and logistics. Representatives from companies based in over 40 countries attend the show. Bunting’s Sales Engineer, Tom Higginbottom, attended the show. FoodTech is a food technology event, held every two years in MCH Messecenter Herning. The exhibition is focused on showcasing the latest technology for the food manufacturing and processing sectors. Tekemas were supported by Bunting’s Head of Sales, Dave Hills. Bunting and Master Magnets are continually searching for new overseas representatives in a wide range of industrial sectors. For further information, contact Dave Hills on dhills@buntingeurope.com. For further information on Magnetic Separators or Metal Detectors used in removing and detecting metal contamination in food, please visit our website or contact us - details below.